There are certain trends that are almost always present every summer–floral, brights, color blocking and like the one I’m wearing here–nautical. One fail-proof combination for this trend is the color red paired with blue. They’re made for each other. You can NEVER go wrong with these 2 colors. When you find yourself too lazy to think of a summer get-up for a casual day out, go for this! 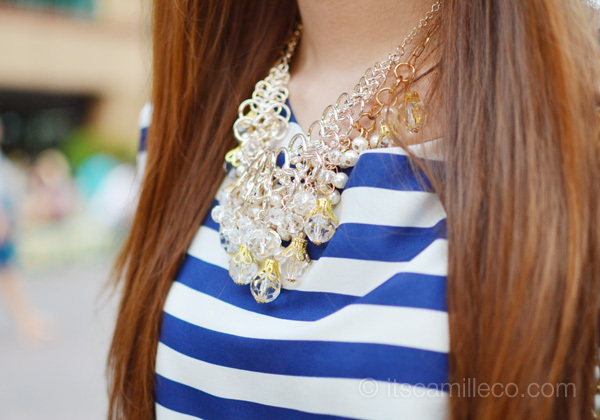 I’m in nautical from head to toe! Even my bag is very cruise/resort wear inspired. No heels here! I’m so happy I got my trusty, foldable flats from Footzyrolls with me. Thank God they’re so light, compact and easy to bring around. Lord knows my feet needed some rest! This particular pair from Footzyrolls is actually pretty cool because it’s sort of 2-in-1. The striped bows in front are removable and you can change them to plain red ones as you wish. How do you like that!? Practical in more ways than 1! 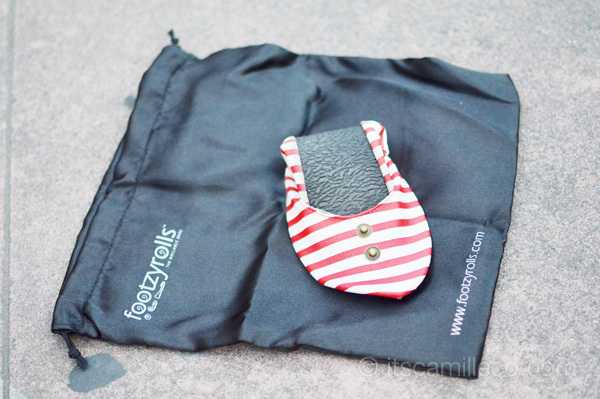 All Footzyrolls’ shoes come with one big pouch and one small pouch. These shoes are really the tiniest and lightest foldable flats I’ve ever encountered! Thanks Sawmi! Extreme Finds, Yhansy, Mia Casa, Bubbles, Fayeness Shop, Gifts Ahoy, etc! Thanks Marielle! :) Start with complimentary colors :) Check the color wheel! It really helps! P.S. ganda po ng legs nyo! How do you or your mom maintain the color of the bags specially chanel or what kind of leather cleaner do you use on your light colored handbags? More power to your blog! luv it! im so in love with your watch! Boy, do I need a pair of fold able flats. Cute look. Thanks Inez! :) Go get some! hi, ate Camille. :)) love your top. I was at F21 last Saturday and I saw a nautical sheer top but I had second thought and didn`t buy it. haha. but I`ll try to buy it pag balik ko doon because I have na the inspiration. this blog of yours. you really inspire me. Thanks Dheya! Nautical prints are great for summer! The shoes are super cute too! It’s a great go-too piece! Thanks Alison! the casio watch is making a statement. Peg list check! I love your outfit but where did you buy your bag chanel? it is too good. Hi Camille! Been keeping in touch with your blog since last year (It’s kind of a habit now, I guess), although it’s just recently that I’ve developed this hobby of leaving love-the-look notes. I’ve always loved red and blue combo but when I saw this my eyes went “whoa!” on the legs! They seem to go on forever! Lucky you! Mine isn’t even close to that. Hahaha. Love your “love-the-look” notes! Thank you Joyce! so cute! so you’re 5’7″ pala, wow! im so inggit.. im only 4’8″..hahaha! i couldn’t agree more! red and blue are like best color friends! love the outfit! i always love it when you do casual chic! looking so fab here camille! inlove w/ chanel stufffs? looks good on u. gorgeous! chanel bag! woot woot! you know what i really love about this blog and the author? Aside from the undeniably fashion statement you’re setting, is your one on one reply to each and every person commenting here. You seemed to be an approachable girl. Can’t wait to meet you. I try my best to keep in touch with my readers :) It’s the least I can do :) Thanks Precious! Pretty!! You look prettier when you smile :)) Keep smiling!! Wow, so many people around and yet sige pose lang. Tiis ganda! I was just wondering how to style some flats! :D They’re so cute! I’ve been looking at those footzyrolls because of their “back-up” qualities, but I also have my doubts. Their lightness and thinness makes them fit into any purse, but I’m afraid that the material might feel like nothing under my feet. The bottoms of my feet hurt when I wear flats that are too thin-bottomed as the pavement feels like they directly hit my soles when I walk. This may sound cliché but I just want to say it myself. I love your styles! I love everything that you do with your clothes, accessories, shoes, etc. This outfit is so me. Love your idea texture on texture. As usual you look like a barbie doll. Kisses from Malaysia.. Hi!! How do you take care of your feet after a day in heels (aside from bringing flats w you)? Thanks! I’m super amazed by you. Who takes your shots? Thanks M! I’m glad you think so! I was just wondering, if I am going to Japan during Summer for the first time, what’s the best fashion tip you can give us specially if we want to be fashion forward but not over the top? Lol I wore the same kind of outfit, but with different brands, in Boracay. Haha hindi naman siguro baka naman tie haha thanks Ana! Weh. Haha I think you accesorized it better, though. I might already have a Halloween costume… YOU! Haha dressing as one of my idols… It’s a first. Haha awww! Kakaflatter to be someone’s Halloween costume! Thanks Ana! Footzyrolls is also featured in my favorite tv show, etcetera. hihi. girly thingy thing, i guess. love how you combine reds, blue, and gold. GALENG! I don’t know! Haha thanks Mikae! I love the accessories! Again, so beautifully put together outfit. Omg I love your blog! It’s my first time on it, but I think the design is so cute and I love your outfit posts too :) You look gorgeous. Ahh, I love your Chanel bag! It’s so pretty!!! Aren’t you scared of it getting dirty? I am! Especially because my mom would kill me if I get it dirty! love these cute little shoes! Hey, I love your outfits, you are so pretty, I’m just curious I’ve always wanted to be tall and you look really tall in this picture…how tall are you? Btw your so lucky that your so tall and pretty! I love everything about your outfit :)) Looks really comfy to wear yet appears very fashionable still. BTW, I fell in love with the shoes!!! Keep inspiring us :) THANKS!